Not only was Frank Hamer an interesting character, but he also set the mold for the Texas Rangers who came after him. Throughout his long career, Hamer always relied on his engraved Colt .45 single action. However, after his horseback days were behind him, Hamer rarely wore a cartridge belt. Instead, he generally carried his sixgun in his waistband and a reload of cartridges in a coat pocket. Hamer was also an advocate of being able to shoot a handgun at longer distances because, he explained, one might not have his rifle handy when a fight started. He also told his biographer, Dr. Walter Prescott Webb, that he only shot from the hip when his attacker was so close that he could not raise the gun to eye level and use the sights. However, my favorite Hamer story has to do with the second clean-up of Borger, Texas. The governor had declared martial law and sent Capt. Hamer in with a bunch of his Rangers to clean things up once and for all. One of the reasons that martial law had been declared was because the police chief , sheriff, and most of their men, were all crooked. Not only were they removed from office, but warrants were issued for their arrests. Pursuant to the issuing of warrants, Hamer sent word to the local lawmen to come down to the courthouse and surrender. When they arrived, Hamer told them to give their guns to one of his Rangers. However, the sheriff informed Hamer that they had all disarmed before coming down to surrender. 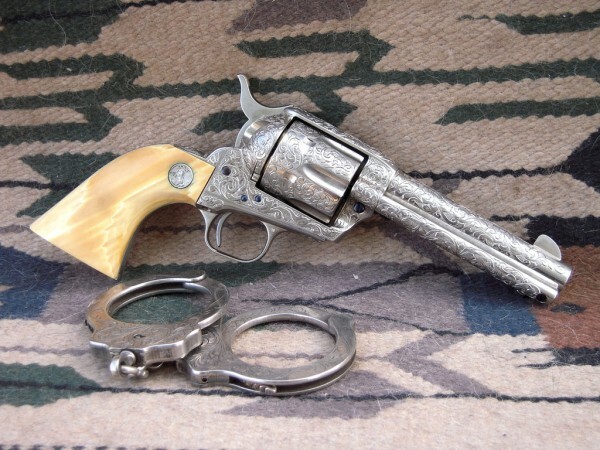 This entry was posted in History, Peace Officers, Revolvers and tagged .45 colt, colt, Frank Hamer, revolvers, single action, texas, Texas Ranger. Bookmark the permalink. Still, at the end of the day, it was a full blown ambush and bushwhacking and treachery that they used to get the 2. Pretty chickenshit. Anyone that ever gave Clyde Barrow the chance of getting off the FIRST shot , died . Period. There was nothing chickenshit about it Blue. They got what the deserved in spades. They were a couple of treacherous psychotic criminals. They put many innocent lawmen in an early grave, men that Clyde Barrow wasn’t fit to shine their shoes. Barrow gave no quarter, so none was given. At the end of the day, Gault, Hamer and the other Lawmen in the posse went home that day. Sheriff Wilson , I sure enjoy reading your stories here and in the magazines you write for . I don’t subscribe to any at the moment . I buy the individual copies that have articles I might be interested in . I have several 94 Winchesters and one 92 Winchester knock off from legacy sport . I have 3 Ruger Super Blackhawks that I enjoy shooting . I want to get my hands on one of the new Ruger 44 special flattops , with the smaller frame . I think I would enjoy one . I came close at a local gun show but I couldn’t get the man to work with me on the trade , but I will keep trying .